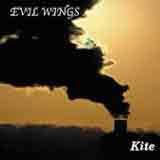 Evil Wings are an interesting band out of Italy. They are not playing symphonic metal as a lot of metal bands coming out of Italy these days are. They play melodic metal with some prog influences and strangely enough, a very evident NWOBHM influence. While the band creates an interesting blend of melodic metal, NWOBHM, and a light dose of prog metal, I can't say that they bring out the best of each of these elements although I like many of their ideas. As with many NWHOBHM era releases (and many current metal releases out of Italy), the production is weak. The vocalist isn't bad, but he is pretty average: he doesn't have an incredible range or an exciting or emotional delivery. But, he doesn't go out of tune and carries a melody reasonably well. In the early 80's, up and coming bands had very limited budgets and very limited technology, so raw production could be expected. However, this is Evil Wings' fourth album, and I certainly expected better production. It's not enough to ruin the sound, but it certainly needs to improve if the band hopes to compete with today's major acts. I don't know what they were thinking with the song Black Rain, but those distorted vocals ruin the song!! Thankfully, the band doesn't toy with the vocal distortions like this in any other songs. The overall sound is very raw, especially the drumming which sounds quite tinny throughout the album. Aside from this, you can expect some loud, energetic guitars which is a direct throw back to the NWOBHM days of the early 80's. Strong, charging riffs mixed with catchy grooves and some shredding throughout the album are highlights of the album. Furthermore, the bassist makes a very strong presence, filling out the bottom end of the sound in a big way: the whole album has a very rich and full sound thanks to this. The prog influence appears in a handful of songs and I wish they would explore this route further in the future. The keyboarding, when used, really adds a lot of depth and feeling to the songs. Night Song, Kite in The Abstract Picture, and Shine in the Neverending Space are simply great songs, each enhanced by dynamic and smart use of keyboards. Evil Wings has a lot of interesting ideas. As for myself, I am a big fan of NWOBHM, prog, and melodic metal. You will find elements of each of these genres on this album. Some songs are more prog in nature, while others might remind you of a lesser known NWOBHM band from years ago. If you like strong guitar work, melodies, and modest progressive influences, you will find a lot to appreciate with Kite if you can get past the lackluster production and very average lead vocals. In the future, I'd hope to see the band expand on the prog influences (they are quite good), while retaining the guitar driven sound.